For those of you who prefer a more permanent reuseable filter fitting on most teapots and cups we have an exceptional filter for you! The Eurotec Laser Mesh Strainer this high grade stainless steel, laser, mesh strainer is perfect for teapots and cups, straining even very fine teas. From handle to handle it measures 4" fitting most pots and cups. 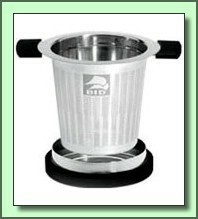 The rubber coated lid also acts as a drip catcher plate after use. Cleans easily. For green tea always cool the water down from its boiling point before infusing. Unlike many lower grade stainless products, 18/8 grade will not corrode when exposed to the Tannins found in loose tea. Many competing stainless products, even those that look the same as products we carry, are not 18/8 and will corrode when exposed to hot tea. This may mean that dangerously high levels of nickel, chromium or aluminum could leach into your tea. Under no circumstances do we carry a potentially hazardous product to increase profit margins.